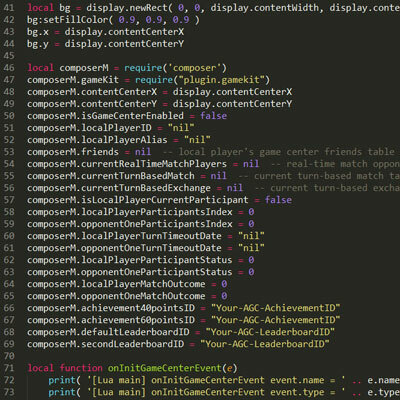 I developed the following code to understand and share how to implement Apple iOS Game Center and Google Android Play Game Services with games made with Corona SDK. Full Apple iOS GameKit Plugin API for Corona SDK – This full featured Apple Game Center plugin is now published and available. GKTester app – Apple iOS Tester app source for the above Corona SDK Apple Game Center GameKit Plugin. GPGSTester app – Android Tester app source for Corona SDK Google Play Game Services (Legacy) Plugin.